Potentially recognizing that the frame work for when police and federal agents are required to seek a search warrant to obtain digital information has become outdated, the United States Supreme Court announced that it will review whether the police are required to get a search warrant in order to obtain a suspect’s cell phone records. Local and federal law enforcement routinely seek cell phone location data from a suspect’s telephone company in order to track the suspect’s whereabouts around the time of the crime. The location data can be extremely powerful as circumstantial evidence in cases where the cell phone data puts the suspect at or near the scene of the crime at the time of its commission. For example, if police believe that the suspect committed a homicide, they could use cell phone location data to show that the suspect was near the decedent at the time of the murder. Under existing state and federal law, police officers are generally not required to obtain a search warrant in order to retrieve this information from a phone company. Instead, in many jurisdictions, law enforcement officers simply submit a request to the phone company, and the phone company will provide the information without a warrant and court order. In other jurisdictions, officers may be required to obtain a court order in order to retrieve the data, but the court orders may be issued on a standard of evidence lower than the probable cause standard required in order to obtain an actual search warrant. This is the case in federal court, where prosecutors must show only that there are “reasonable grounds” for the records and that they are “relevant and material” to an investigation. Courts have traditionally allowed police to dispense with the warrant requirement in obtaining this type of data because the data is not stored in the suspect’s phone or on the suspect’s person. Instead, the defendant necessarily shared the data with a third-party, the phone company, by using the phone. Thus, courts have held that defendants do not have a reasonable expectation of privacy in information that they have publicly shared or shared with third parties, and courts have not needed to obtain search warrants in order to obtain that type of information. As a general rule, defendants may move to suppress the results of a search only where they had a reasonable expectation of privacy in the place searched. Obviously, you have a reasonable expectation of privacy in your home, car, and pockets, but courts have rejected the idea that a criminal defendant has a reasonable expectation of privacy in something that he or she has shared with a third party. This rule may have made sense twenty years ago before the advent of technology which literally tracks a person’s every movement. Devices like cell phones, sports watches, and GPS systems all track a person’s whereabouts at all times, making it much more difficult for the government to argue that a suspect should not have a privacy interest in the resulting data. If the government is not required to obtain a search warrant, then the government can essentially obtain all of the details of a person’s life without even having probable cause. After recently determining that police must have a search warrant in order to search the contents of an arrestee’s search warrant, this case suggests that the High Court may be prepared to re-think the reasonable expectation of privacy doctrine given the realities of modern technology. The case on appeal is Carpenter v. United States. In Carpenter, without getting a search warrant which would have required probable cause, FBI agents obtained cell phone records for the defendant from his phone company which covered 127 days and revealed 12,898 separate points of location data. The data ultimately connected Carpenter to a string of cell phone store robberies, and Carpenter was convicted at trial. On appeal, the Sixth Circuit Court of Appeals ruled 2-1 that the Fourth Amendment does not require law enforcement to obtain a search warrant prior to seeking this type of data. Carpenter has appealed to the United States Supreme Court, and the Court will review whether the police should be required to obtain a search warrant in order to get this highly personal data. Search warrants are not particularly difficult for the government to obtain, and a decision in favor of Carpenter would limit the government’s ability to track your every movement without at least some showing of probable cause. If you are facing criminal charges, we can help. 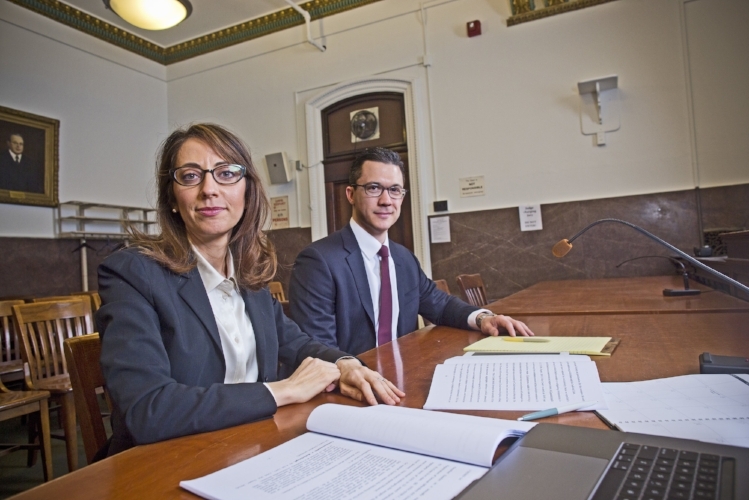 Our Philadelphia criminal defense lawyers have successfully defended thousands of clients against a wide variety of criminal charges in preliminary hearings and at trial. Call 267-225-2545 for a complimentary 15-minute criminal defense strategy session with one of our award-winning defense attorneys. Do Police Need A Warrant To Search A Hotel Room? Under the United States and Pennsylvania Constitutions, law enforcement officers need a search warrant anytime they want to search a suspect's private residence with few exceptions. If the police do not obtain a warrant prior to conducting the search of a home, then the owner of the home and any guests who are staying there could potentially have any incriminating evidence which was found in the search suppressed and excluded from trial. This same basic rule requiring police to get a search warrant also applies when police want to search a hotel room. If you are a guest in a hotel, the police cannot search your room without a search warrant. Unfortunately for the defendant in Commonwealth v. Williams, the Superior Court held that the defendant has the burden at the Motion to Suppress hearing of showing that the defendant actually rented or was staying in the hotel room. In Williams, the defendant was charged with three counts of Possession with the Intent to Deliver, possession of drug paraphernalia, and two counts of possession of a controlled substance. The defendant moved to suppress the evidence because police searched the hotel room in which the drugs were recovered without a search warrant. At the motions hearing, the prosecution established that police officers in Erie, Pennsylvania responded to a 911 call for a shooting on March 18, 2016 at the defendant's home. Once there, police found a dead pit bull, lots of blood, and a man who had been shot in the leg and face. Police did not find any other victims or the shooter, so they began interviewing the neighbors. One neighbor informed police that the defendant lived in the first floor apartment at that location, and he had seen one of the defendant's vehicles leaving the area around the time of the shooting. The officer looked in the window of the apartment and did not see anyone home, so he radioed for the car to be stopped. Other officers stopped the defendant in the car which the neighbor had seen. Once stopped, the defendant told police that he had been staying in a nearby a hotel with a friend because of ongoing domestic issues with his girlfriend. He showed the officer a key card for a hotel room, and he told the officer that the key was for room 111. He also told the officer that he was in room 111 at the time of the shooting. Following this conversation, officers removed the defendant from the vehicle and frisked him. They also frisked the passenger and recovered a gun. At some point, after the conversation had occurred, officers also searched the car for weapons, and during this search, they found that the defendant had taken the hotel key card from his wallet and discarded it in the vehicle. Williams had apparently dropped the card between the driver's side seat and the center console of the vehicle, so the police took it. Based on this information, an officer went to room 111 and knocked on the door. When no one answered, the officer went to the front desk and spoke with hotel management. Management informed the officer that the key card was not for room 111 and that the card was actually for room 231. However, the employee did not know who had actually rented room 231. Further, the employee stated that the hotel did not have surveillance footage which would show who had rented the room. Apparently concerned that another shooting victim might be in room 231, the officer went and knocked on the door for that room. When no one answered, the officer decided that it was an emergency. Instead of waiting for a search warrant, he used the key card and opened the door. The officer immediately smelled marijuana and found drugs and drug paraphernalia in the room. He did a quick check of the room for shooting victims, and then he obtained a search warrant to recover the drugs and paraphernalia. For reasons which are not explained in the Court's opinion, the defense did not challenge the stop and search of the defendant's vehicle or subsequent seizure of the room key. Instead, the defense argued that the drugs in the hotel room should be suppressed because the police were required to obtain a search warrant prior to entering the room. The Commonwealth responded with two arguments. First, the Commonwealth aruged that the defendant failed to establish that Williams had a reasonable expectation of privacy in the hotel room because there was insufficient evidence to show that he had rented or was staying in the room. Second, the Commonwealth argued that the exigent circumstances surrounding the shooting justified the police decision to enter the room without a search warrant because there could have been another victim who needed medical assistance in the hotel room. The exigent circumstances doctrine permits law enforcement to enter a house without a warrant during a true emergency. If police reasonably believe that someone is dying inside a home, then the police do not have to wait for a search warrant before entering the home and rendering aid. Of course, if they find something incriminating in plain view during their attempts to render aid, then that evidence wil be admissible at trial. This issue often comes up in cases involving burglary alarms. If a burglary alarm goes off and police do not find anyone at the scene when they arrive to investigate, they may decide to enter the home without a warrant and check for burglars. If they find your drugs and guns inside the house while looking for burglars, it will often be difficult to have that evidence suppressed despite the absence of a search warrant. The trial court agreed with the defense and granted the Motion to Suppress. The trial court found that police were required to obtain a search warrant prior to entering the hotel room because a guest in a hotel room has a reasonable expectation of privacy in the room. Further, the court found that the exigent circusmtances exception to the warrant requirement did not apply as police had no real basis for believing another shooting victim to be in the room. Therefore, the court found that even though the drugs were in plain view once police entered the room, the drugs should be suppressed because police only saw the drugs because they illegally entered the room without a search warrant. The Superior Court disagreed and reversed the Order granting the Motion to Suppress. The Court found that the defendant failed to establish that he had a reasonable expectation of privacy in the hotel room. The defendant presented no witnesses, so the Commonwealth's evidence was essentially uncontradicted. Under Pennsylvania law, a defendant who is charged with a possessory offense like Possession of a Controlled Substance has automatic standing; this means that the defendant may always move for the suppression of the items sized. However, in addition to having standing, a defendant who moves to suppress evidence must also have had a reasonable expectation of privacy which was violated by some sort of law enforcement action. If the defendant did not have a reasonable expectation of privacy in the place searched, then it does not matter if the police followed the rules. For example, if the police illegally search your house and find evidence which they wish to use against me, then I would not be able to successfully have the evidence suppressed because I did not have a reasonable expectation of privacy in your house. If they wanted to use the evidence against you, you would be able to win a Motion to Suppress because it was your house, but I would be out of luck. The Court noted that a reasonable expectation of privacy exists when an individual exhibits an actual or subjective expectation of privacy and that expectation is one that society is prepared to recognize as reasonable. Courts must evaluate the totality of the circumstances in deciding whether a defendant had a reasonable expectation of privacy, and the test does not depend solely on the subjective intent or belief of the defendant. Further, prior case law established that although it is the Commonwealth's burden to prove that evidence was obtained legally at a Motion to Suppress hearing, the burden remains on the defendant to show a reasonable expectation of privacy. Do the Police Need a Warrant to Search a Hotel Room? Pennsylvania law is very clear that a hotel room deserves just as much protection as a private home or office. A registered hotel guest enjoys a legitimate expectation of privacy in a hotel room during the period of time in which the room rental remains valid. However, the expectation ceases to be reasonable after the rental period has ended and/or the guest's right to occupancy has lapsed. A person also does not have a reasonable expectation of privacy in a room in which they are not staying. Here, the defendant would have been in much better shape for the Motion to Suppress had he testified that he rented that particular hotel room and believed it to be private. However, he did not do so. Instead, he told police that he was staying in a different hotel room, and he actually tried to discard the key to the room. Further, when police spoke with hotel employees, they were told that the hotel did not know who had rented the room and also did not have any video surveillance which would show defendant staying in that room. Accordingly, the only evidence in the record was that defendant had a key to a room in which he did not admit to staying. Therefore, the Superior Court found that the defendant failed to establish that it was his room and correspondingly that he had a reasonable expectation of privacy in the room. Police were not required to obtain a warrant prior to the search, so the Court did not even reach the issue of whether emergency circumstances justified the warrantless search. The Williams opinion, although intellectually dishonest, illustrates the dangers of relying on the Commonwealth's evidence to establish a reasonable expectation of privacy and constitutional violation on the part of law enforcement. It also shows how unforgiving Pennsylvania's reasonable expectation of privacy doctrine can be compared to New Jersey's much more relaxed standard. Of course, it is obvious from the record that the room had been rented by Williams. A court could have easily inferred, as the trial court did, that it was his room. He had the key, he lied about which room he had rented because he knew there were lots of drugs in it, and the police only searched it because they believed it was connected to him. Indeed, if the prosecution did not believe that it was his room, then they would not have charged him with Possession. It is a certainty that the prosecution will not be withdrawing the charges despite arguing that it was not Williams' room on appeal. Nonetheless, once Williams claimed to have been staying in a different room, he probably needed to testify at the Motion to Suppress hearing in order to establish that it was his room. If he had testified that it was his room, then the Court would not have been able to find that he did not have a reasonable expectation of privacy therein. There is often a great deal of reluctance to call criminal defendants to testify for fear that they will say something incriminating or open the door to some other type of incriminating evidence which would have been otherwise inadmissible. Additionally, if the defendant has prior convictions for certain crimes of dishonesty (burglary, robbery, theft, etc. ), then the fact of those convictions may become admissible when the defendant testifies. However, in some cases, it is simply necessary. Here, Williams likely should have testified that it was his room. This is particularly true because the defendant's testimony during a Motion to Suppress hearing may not be used against the defendant at trial even if the Motion is denied unless the defendant testifies to something inconsistent at trial. Therefore, Williams had little to lose by conclusively establishing that it was his room. As always, if you are facing criminal charges, we can help. Our Philadelphia Criminal Defense Lawyers have won motions to suppress drugs, guns, and other contraband in cases involving car searches, house searches, and searches of hotel rooms. We can help at both the trial and appellate level. Call 267-225-2545 for a free criminal defense strategy session. The Pennsylvania Superior Court has just decided the case of Commonwealth v. Runyan, 2017 PA Super 114. In Runyan, the Commonwealth sought reversal of a suppression order which found that police could not automatically search the purse of a passenger in an automobile even where police had probable cause to search the car itself. The Superior Court held that if police have probable cause to search a car, they may search all containers within the car in which they could reasonably expect to find the object of their search. Accordingly, police in Pennsylvania no longer need a search warrant in order to search bags or other containers in a car if they have probable cause for the search of the car. This is true regardless of whether there is any link between the container being searched and the driver of the car. In other words, police may search the purses and luggage of passengers in the car. In Runyan, local police officers in Mercer County observed a sedan parked with four occupants in it. Police observed the sedan in an area that the officers described as a high crime, high drug area. The vehicle was parked there late at night, so officers approached the vehicle to see what was going on. As one of the officers approached the vehicle, he smelled the door of burnt marijuana coming from the area around the vehicle. When he walked up to the passenger side door, he could see a small bag of marijuana on the back seat passenger side floor. Naturally, the officer mentioned the bag of marijuana to the occupants of the car. The driver then attempted to crawl from the front of the car into the back seat and exit the car. At that point, the police officers asked everyone to get out of the car, handcuffed each occupant of the car, and began searching the vehicle. Upon searching the car, the officer recovered the bag of marijuana which he had seen on the floor. Additionally, he found a number of purses in the car, and the officer searched those purposes. In one of the purses, he found a spoon, syringe, and crack pipe. The spoon had white residue on it, so the officer concluded that he had found drug paraphernalia. In another purse, the officer found a spoon with white residue on it and a number of syringes. That purse, unfortunately, also had the identification card for the defendant, Ms. Runyan. The Commonwealth appealed, and the Pennsylvania Superior Court reversed the trial court’s order suppressing the drug paraphernalia. The Superior Court cited the recent case of Commonwealth v. Gary in which the Pennsylvania Supreme Court held that police do not need a warrant to search an automobile. Instead, because of the inherent movability of a vehicle and possibility that evidence could be lost during the delay inherent in obtaining a warrant, police may search an automobile whenever they have probable cause to do so. Probable cause means that it is more likely than not that the police will find some sort of contraband or evidence in the car. Obviously, the odor of marijuana, bag of marijuana in plain view, driver’s attempt to flee from the back of the car, and the officer’s extensive experience in making drug and marijuana arrests all combined to establish probable cause that there would be some kind of drugs or more marijuana in the vehicle. Therefore, the Superior Court held that officers could search any container in the car in which the contraband could be concealed, including Ms. Runyan’s purse. The United States Supreme Court has already held that police may search any containers within a car when police have probable cause to do so. Therefore, following the Pennsylvania Superior Court’s decision, Pennsylvania and federal courts will now apply the same standard in automobile search cases. Police need only probable cause in order to search any container within the car. Despite the Superior Court’s ruling, there are often still defenses in cases involving searches of cars. Although police may search the car and the containers therein when they have probable cause, it is often possible to challenge both the initial stop of the vehicle and whether the police really had the probable cause to conduct the search. First, depending on the type of stop, police must have either reasonable suspicion or probable cause to actually conduct a stop of a vehicle. If the defense can show that the police stopped the car arbitrarily or pretextually, it may be possible to have all of the results of the stop suppressed. Second, if the police did not actually have probable cause to search the car, then the results of the illegal search would be suppressed. Here, police saw drugs in plain view and the driver attempted to flee, but in many cases, the evidence of contraband is not so obvious and can be challenged. Finally, many drug possession and gun possession cases raise issues of constructive possession. In this case, Ms. Runyan made the foolish decision to store her identification card with her drug paraphernalia. However, in most cases, people do not do that. Had her ID not been with the contraband, then police would have had a difficult time establishing to whom the purse belonged without some kind of statement. The Philadelphia Criminal Defense and Drug Defense Lawyers of Goldstein Mehta LLC can help with drug and gun cases in Philadelphia. We have litigated and won countless motions to suppress and possession cases involving vehicle searches and other searches in Pennsylvania and New Jersey. Our lawyers will work closely with you to build the strongest possible defense to your charges. Call 267-225-2545 for a complimentary, 15-minute criminal defense strategy session.